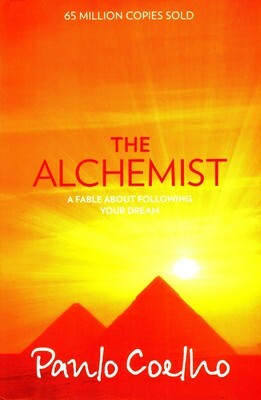 The way i ends up buying the book ‘The Alchemist’ was indeed happened as if it was meant to happen. Call it fate or coincidence or meant-to-be. I would’ve never bought this book, if i’m happy enjoying my long vacation. So i was in a state of worry, depression that made me look around for some self-help books in the book-store. That’s were i saw The Alchemist, in an indian edition affordable for me. See, i’ve already started looking at the Omens of the past. I’ve heard lot of friends shouting ‘The Alchemist’, when asked what their favorite was. So i was much anticipated, yet after some pages i’m not convinced. Later on i started understanding the spirit of the book, the ideas or the abstract essence of the language of the world. Written in simple way, conveying how simple every complicated things are, yet highly thought provoking if you let your mind wander about. Now everything in my everyday life (Atleast for a couple of months !) i see it with a different kind of angle. There was a little more interest in me towards the simple things, considering that has an effect on me, perhaps a message for me. Not to be surprised, but this isn’t my first kind of experience. The Greatest of tv series ‘Lost’ had also similar kind of effect in me. It deals with fate, and everything happen for a reason, kind of thing. Anyway , you must try it. its a awesome exhilarating stuff. Next story Improved Technology = Advanced Laziness !